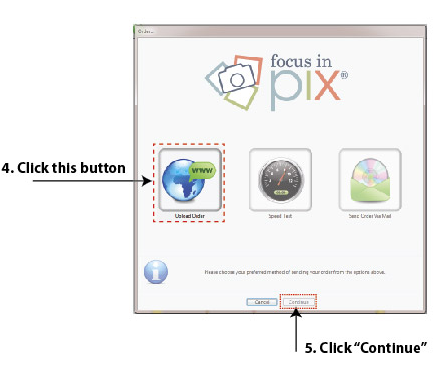 Focus in Pix is FREE software provided by Cornerstone Copy Center. 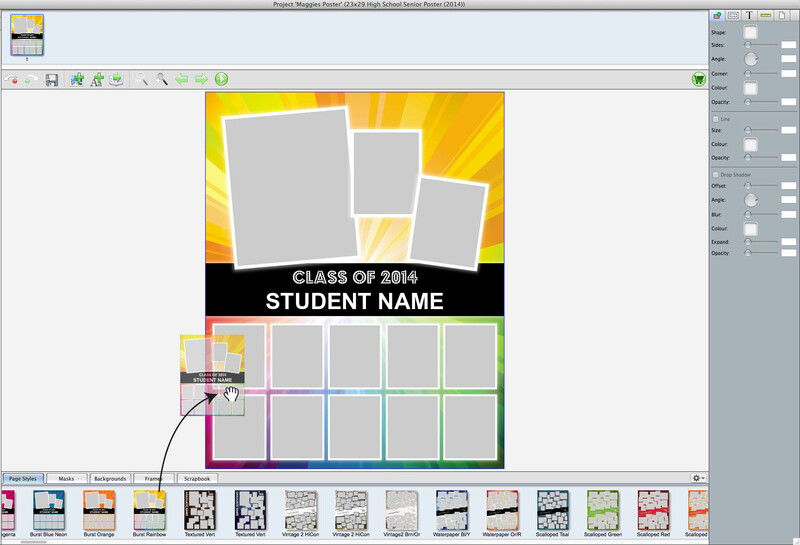 Select from the many pre-designed templates specially created for graduation posters, or design your own. For a print-friendly version of this page, click here. When creating a project with Focus in Pix, it is not stored on the internet. You can only access your project from the computer you started the project on. Photos used in your project are linked to a specific location on your computer hard drive. You must leave the photos that are used in your design in the same location from the time you start creating your poster until after you have ordered. We recommend keeping the photos used in your projected stored in the same location for at least a week after your poster is ordered. This is a safeguard just in case there are last minute changes or transmission problems when uploading or receiving your poster on our server. For best results create a folder on your computer to store all the pictures you plan to use on your poster. Create this folder in a location that is easy to find (such as the desktop). If photos are stored on CDs, flash media or USB drives, copy those files into this folder onto your computer. 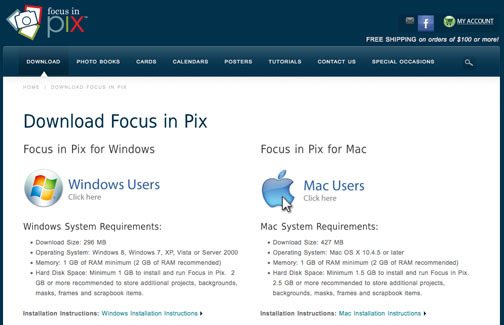 Click here to download Focus in Pix software installer. Choose Windows PC or Mac operating system. Follow the instructions to install the software onto your computer. You may need to update your software to see the most recent version of the Graduation Poster project. The ‘Auto Update’ list may appear automatically or can be forced to show when clicking on ‘Create a New Project’ and then clicking the ‘Check for Updates’ button. Important: You do not need to update your software with all our Products, Backgrounds and Scrapbook items. To save time, be selective and only update those that you plan to use. 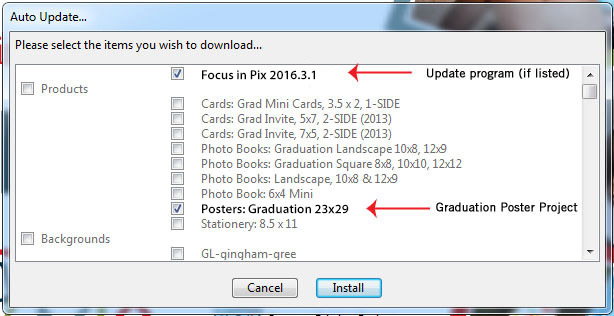 If it has been a while since you installed your software, you may need to update your application to the latest version before you can see the Graduation Poster project in the Auto Update list. Click ‘Create a New Project’ and then click ‘Check for Updates’ button. If there is a program update, it will appear at the top of the Auto Update list. After the program update has installed, you will then need to update your Graduation Poster project with the current year’s version. Click “Create a New Project” to begin a new project. Choose Category: Click on Graduation Products, click Next. Choose Product Type: Click on the Posters: Graduation (20xx) poster, click Next. 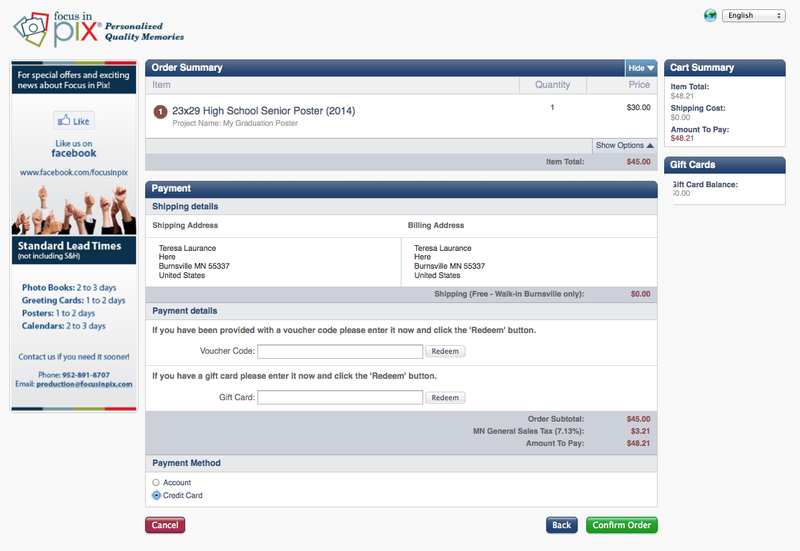 Choose Product: Select one of the Graduation Poster designs available. Click Next. 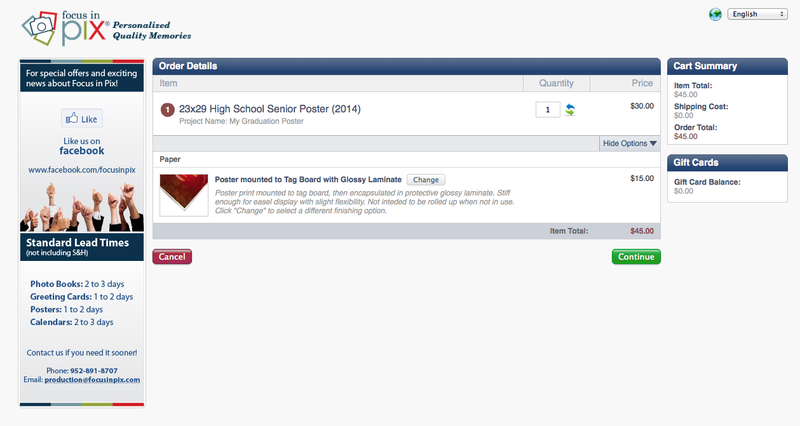 Note: Select ALL DESIGNS: 23×29 Graduation Poster (20xx) to have access to all graduation poster designs, or click on a school name to see school branded designs only. You will be prompted to name your project. Type in a name for your project into the box. Click “Create” button. When the Graduation Poster project page appears, Drag-and drop page style designs from the Page Styles tab onto the page to switch between design templates. 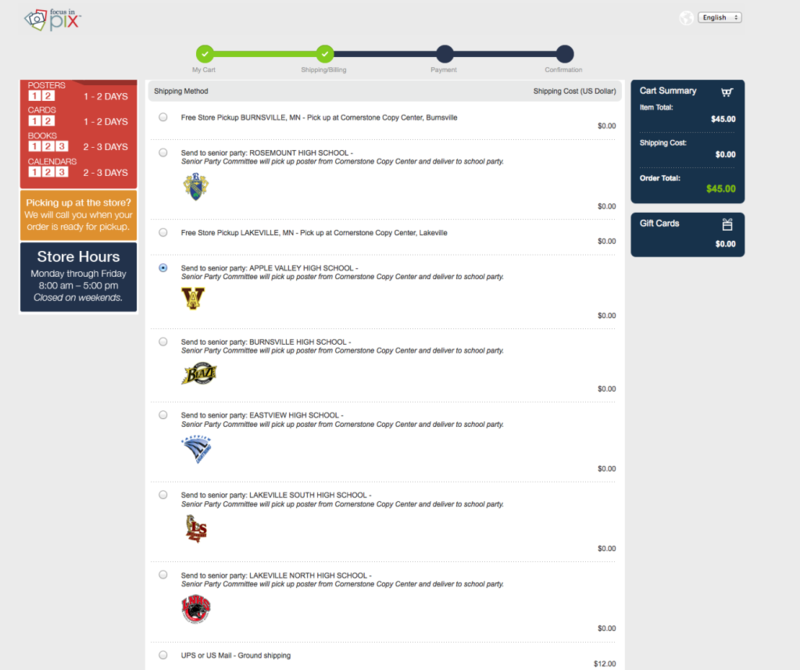 Tip: There are several designs that feature school logo and school colors (for participating schools). As an alternative, pick a design without school colors that matches your own personality and then simply add your school logo from the scrapbook tab located near the bottom of your screen. 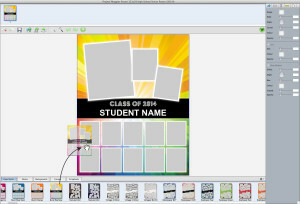 Simply drag-and-drop the school logo from the scrapbook tab onto the page. Import pictures into Focus in Pix by clicking on the “+” button in upper left corner of screen. Tip: We strongly recommend creating one folder on your computer to store your photos for your project. 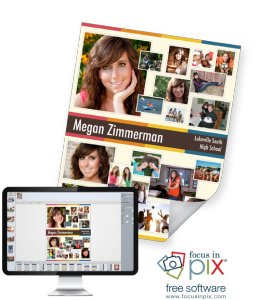 Copy pictures from CDs, USB drives and other media into this folder and then add the entire folder to load your pictures. Loading pictures from multiple CDs and other media will cause errors since the program can no longer find the pictures once the media is removed from the computer. Drag-and-drop pictures from the ‘Pictures’ tray onto the page. To fill a picture box with a picture, drag the picture directly on top of the picture box. Before you drop it onto the page, look for the blue outline surrounding the destination box to be sure it lands in the correct box. To replace a picture on your page, drag and drop a different picture on top of it. Before you drop it onto the page, look for the blue outline surrounding the destination box to be sure it lands in the correct box. To remove a picture from a picture box, right-click on the picture and select ‘Clear’. 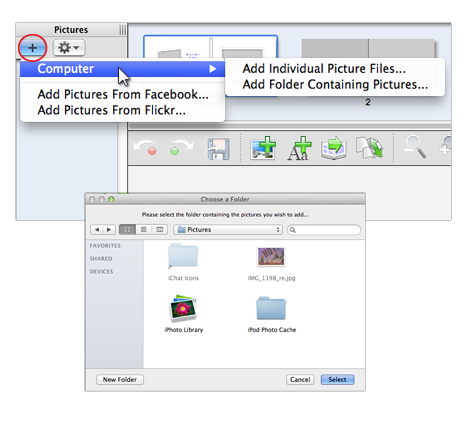 To remove an entire picture including it’s picture box, right-click on the picture box and select ‘Delete’. Adjust Cropping: Double-click on a filled photo box to adjust cropping. The cropping tool dialog box will appear. To crop in on the picture, click and drag the “tab” located in the lower right of the picture. 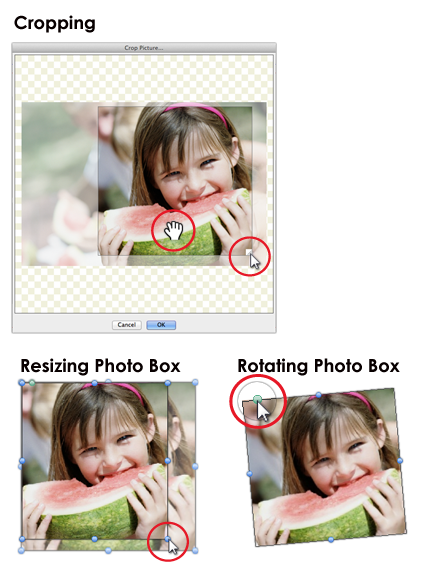 Use the hand tool to drag the cropping area to the desired area on the picture. Adjust Size: Select a filled picture box on the page. Drag any of the blue handles that appear around the edge of a picture box to adjust the size of the box. Rotate: Select a filled picture box on the page. With your mouse pointer, click on the green handle that appears near the upper left corner. The green handle is next to the blue corner handle on the top side of the picture box. Drag the green handle to the left or right to rotate the picture box. 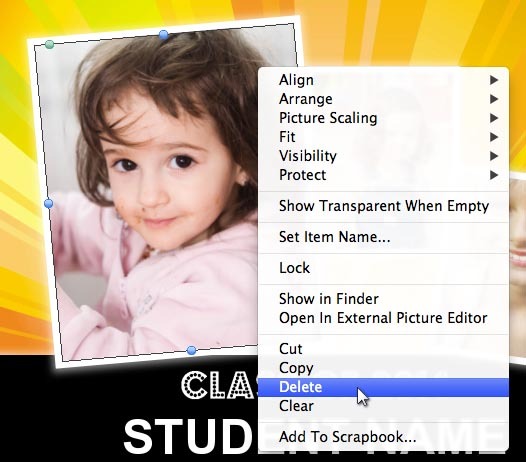 Delete Objects or Extra Photo Boxes: To delete extra photo boxes (or any object) from the page, right-click on the object and select “Delete” from the menu. You can also delete items by selecting the object with your mouse and then press “Delete” or “Del” on your keyboard. 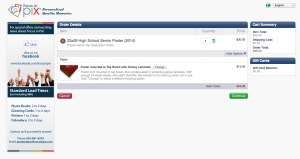 To Add Additional Photo Boxes to the Page: Choose a box already on the page to copy and paste. Click on the box once to select it. From the top menu, choose Edit > Copy. Then from the top menu again, choose Edit > Paste. The copied box will appear in upper left corner of the page. Position the box on the page, then drag a new picture into this box to replace the old one. Tip: When choosing a box to copy, choose one that fits the proportion of the picture you want to add. 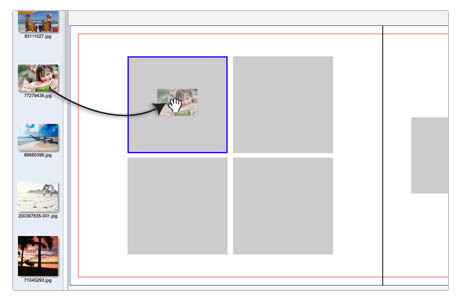 For example, if the picture you want to add is portrait/vertical in proportion, choose an existing box on the page that is portrait/vertical in proportion. 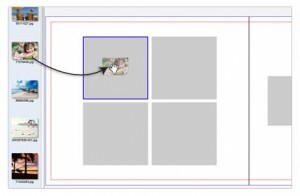 For landscape/horizontal proportioned pictures, choose an exisitng box on the page that is horizontal or landscape proportion. To add the graduate’s name, double-click on “Student Name” or “Graduate Name” text box on the design to see a blinking cursor inside the text box. With mouse, select existing text by clicking and dragging over existing text. With all of the existing text selected, type the graduate’s name using your keyboard. Adjust font style and size in the Text Properties tray on the right side of the screen (under the “T” icon). Choose any font style installed on your computer by clicking on the Font pull-down menu. For font size, the pull-down maximum is 72 point. For text larger than 72 point, type a font size number into the Size box (below the font style) and then hit “Return” on your keyboard. If you get an error message on your text box that states “Text Overflows Box”, either undo and choose a different font size, or make the text box larger (using the handles around the text box). Then, double-click, select the text inside the text box and decrease the font size number so it fits. Note: You must select text with mouse cursor to apply font style and size changes to the text. To order, first preview your design with the preview button. Then save your design with the Save icon or choose File > Save under top menu. 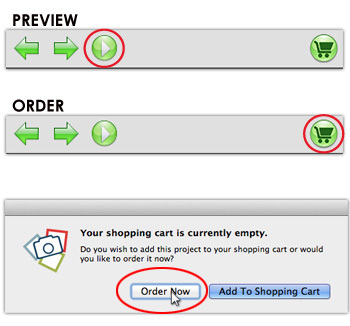 Then click the green shopping cart icon to begin checkout and pay for your poster online. 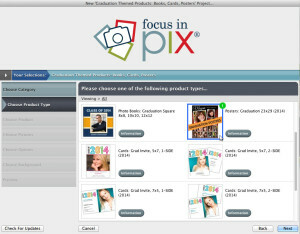 If you have never ordered from Focus in Pix before, you will need to create a new account. Click “Create a New Account” button. 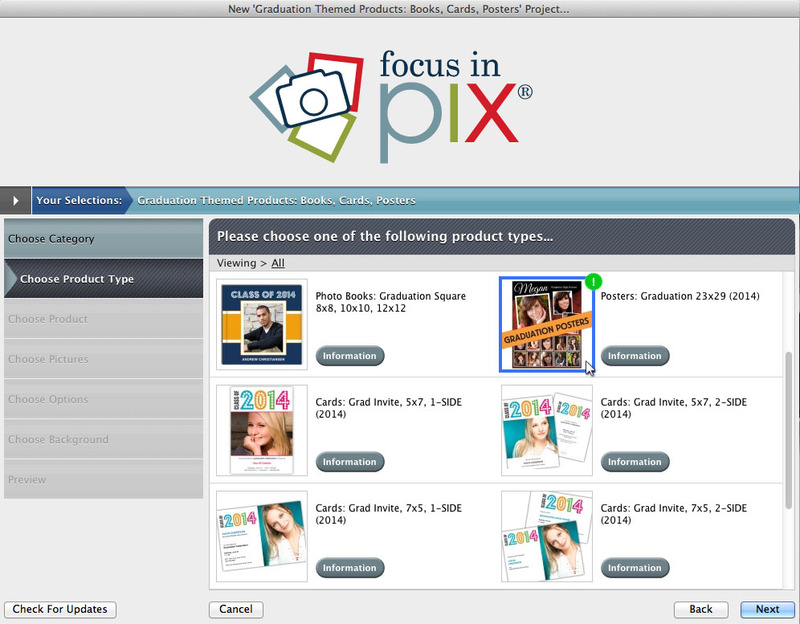 If you have ordered from Focus in Pix before, log in with Login and Password credentials. Login details are capitalization sensitive, therefore if when you set up your account you used capital letters, you will need to use them again to access your account. On the Order Details page, type in a quantity (1 is the default). Select mount and/or lamination option that your school has recommended. The default option is a print mounted to premium tag board with protective laminate. To change this option, click the “Change” button. Click here for more details about mount and lamination options. When all the information on this page is correct, click “Continue” button. Under Shipping Method, select an option. For store pickup, choose from either of the store locations. If you have a voucher code or gift card, enter the code into the correct box, then click “Redeem” button to apply. Make sure the code was accepted. If you have trouble with a voucher code, try to copy and paste it into the box instead (make sure there are no extra characters or spaces). Click “Confirm Order” button to proceed to pay for order with credit card. Once your order has been paid for, you will be instructed to close the browser window. 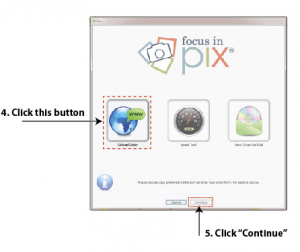 Your project should still be open in the Focus in Pix application. Alt-tab or click back to Focus in Pix. When the dialog box appears, click the “Upload Order” button and then click “Continue” button to upload your poster artwork to our server. If you have any problems with this step, it may be related to antivirus and/or firewall settings on your computer or your router. Try to disable either or both of these items temporarily so your computer can communicate with our server. If you have any other issues with your order upload, please contact us as soon as possible. Once we receive your order and upload, you will receive an order confirmation via email. Please plan 1 to 2 business days for printing and finishing your poster. We will do everything we can to meet your deadline for the school party, but in the event there is a problem and/or we cannot send your poster to the party, you will be notified to pick it up. If you selected to pick up or preview your poster, we will call you at the number you provided when it is complete. This problem must be fixed before submitting order or the missing picture will not appear on final print. How did this happen? The ‘Missing Picture’ message will appear on pictures whose files have been moved from their original location on your computer. The original location is where the pictures were stored when they were imported (or linked) into Focus in Pix. How to fix this problem: Move the pictures back into their original location on your computer, or re-link the pictures from a different/new location by clicking on the + button in the upper left corner of your screen. Re-linking the pictures to a new location on your computer will require the newly linked pictures to be added to your poster to replace the previously linked pictures. Alternatively, you can choose the option to ‘find pictures’ using the Missing Pictures dialog box. 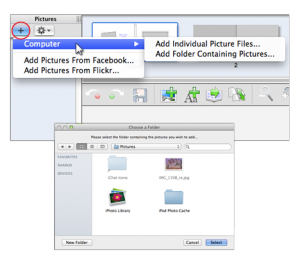 The Missing Pictures dialog box will appear when attempting to open a project with missing pictures. It is optional (but recommended) to fix this problem before submitting your order. Lower resolution pictures may print soft or out of focus. The degree to how poor the quality will print depends on the file size and can vary between only slightly soft to greatly out of focus. How did this happen? The ‘Low Quality Picture’ message will appear on pictures that were saved at a lower resolution than what is recommended for print. This may appear on pictures that were emailed or copied off web pages, cell phone pictures, or pictures that were not scanned at a high enough resolution (dpi). This message may also appear when over-enlarging pictures and scrapbook images on your page. How to fix this problem: We recommend any of the following solutions to fix this problem. Resize the picture box smaller on the page to see if the alert disappears. Replace the picture with a higher resolution version that was saved off the original camera (if available). If the picture was scanned, re-scan the picture at a higher resolution and/or larger dimension. Generally, pictures used in Focus in Pix should be scanned at 100% size at 200-300 DPI. Even though the resolution of the picture may not be optimal, it still may still be satisfactory to you. You may want to view the picture magnified on your screen to see if the quality is to your satisfaction. To magnify the picture on your screen, open it with another software program and enlarge it on your screen to around the same size it will appear on the poster. If you are satisfied with how the picture looks on your screen magnified, you will most likely be satisfied with how it will print on your poster. This problem must be fixed before submitting order. How did this happen? The ‘Text Overflows Box’ message will appear on a text box when there are too many characters or the font size and/or line spacing is too large to fit inside text box. Sometimes this happens when extra lines and/or extra spaces have been added either before or after the text inside the text box. Make the text box larger to accommodate all the text inside the text box. Click once on the text box to select it. Sizing handles (dots) will appear on corners and sides of the text box. Click and drag on any of the sizing handles (dots) to them to make the box larger. Delete any extra characters, blank spaces and extra lines not needed. Double-click on the text box that shows the error to begin editing the text. Check for extra line returns and/or extra blank spaces by putting your cursor after what appears to be the last character in the text box. Use the ‘delete x >’ key on the keyboard that deletes spaces in front of the character selected. Note: You may find this step easier by first making the text box larger and then deleting any extra empty spaces or lines. When done, resize the text box smaller to its original size. Reduce the font size of the text inside the text box. Use your mouse to select any or all text to make smaller. Use keyboard keys Ctl+A (PC) or Command+A (Mac) to select all the text in the text box. Near the top under ‘Font’ change the font size number to a smaller number by using the font size pull down or typing in a new number + return. Reduce the line spacing of the text inside the text box. Under ‘Spacing’ change the ‘Paragraph’ setting to a smaller number by using the slider or by typing in a new number + return. Visit www.focusinpix.com/quick-guide to learn how to use Focus in Pix features in more detail.